Something stirs in the darkness, a shadow cast under a pale moon, branches snap and break as a monstrous force tears through the underbrush towards its prey. A woman screams, fleeing into the forest, her companion is not so quick. Carnage, horror, the beast has struck again. These lonely places are haunted by an ancient presence, a malevolent creature born of a terrible curse. Two men stand between the monster and the world come to fear it. Two men who have dedicated their lives to the hunting of such a beast. They are on the trail now, pausing only occasionally for tea, a bit of a poem, maybe to sketch an interesting drooping toadstool. They are drawing closer, and the outcome will forever change their lives and all those around them. 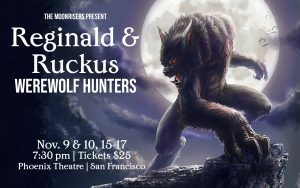 An original comedy and a West Coast premiere.